After two nights in New Orleans, I was in pretty good shape all things considered. Some luck at the blackjack tables at Harrah’s left me up a little bit. And some alcoholic willpower left me functional despite a couple of visits to Bourbon Street over the first couple days. So Saturday, with very little on the Cruise Holidays convention docket, I decided to make it my day to really explore the French Quarter. There are so many worthwhile tours in New Orleans – the garden district, plantations, swamps, airboat rides – but I wanted to hold off on those until I can get my wife back down here. My day started with beignets and some gossip at Café Du Monde, a world-famous beignets and coffee stand I talk more about in my culinary keys to a first-time Big Easy visit. While indulging in these insanely great French doughnuts, I heard a couple at the table next door talking about some celebrity people watching. “This seems like the weekend to be down here. I hear Jay-Z, Beyonce, Sandra Bullock, Ben Affleck, Drew Brees and Matthew McConaughey are in town,” the woman said. Now listen, I like the first five celebs on that list. But I have a bona fide man crush on McConaughey. I view him much like my New England Patriots and Boston Red Sox fandom. I was a fan of those teams in the suffering days before the titles and before the bandwagon filled up. Y’all rediscovered him with “The Lincoln Lawyer” and “Mud” leading up to “The Wolf of Wall Street” and “Dallas Buyers Club.” I was there all along with Mr. Awright, Awright, Awright. So, this would clearly create a detour in my food-focused day. I took to Google to get a bead on sightings and itineraries. But pretty soon, the clues started coming to me, literally. As I made my way to Jackson Square from Decatur Street, I started noticing people wearing “Amazing Race” shirts. But there were no cameras and Nike logos on it. A little sleuthing quickly turned up that McConaughey was an honorary captain as part of Brees’ annual “Amazing Race” competition throughout the city, leading up to his charity gala. Plus, unlike many of the tabloid sites that said Matty Boy was in town to film a segment for the “Amazing Race” show, I actually talked to contestants in this game, who gave me the lowdown. 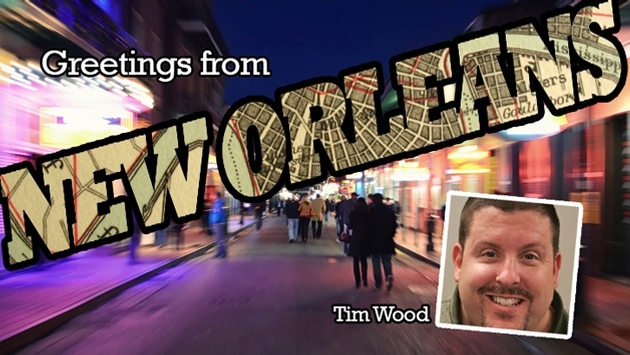 “Yeah, he’s out and about around the French Quarter, staying there with his family. I saw him a little bit ago on Bourbon,” said one contestant. I beat feet across the Quarter to Krazy Korner, a bar and music joint pumping out soul-soothing Zydeco from the live band. There had been a sighting here apparently. “Haven’t seen a thing,” the bouncer told me. Clearly he had been paid off by the McConaughey camp. No worries. I approached a few more “Amazing Race” contestants, who told me to try one of my favorite spots. 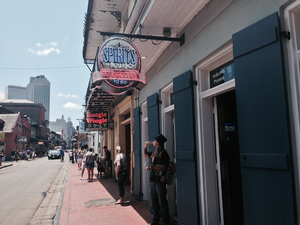 I headed over to Spirits on Bourbon, the “Bar Rescue” bar and grill. While dining on the most delectable burger I’ve had in a long time, I got some further intel. So I too sat in the signature attraction and began feeling McConaughey’s spirit. With so many eateries to hit for “research” and my time in town winding down, I decided it was time to punt on my pursuit. In the end, this Splash News photog had better luck tracking down my man, alongside Drew Brees overlooking the festivities in the French Quarter. When I got back home, I even saw that our own Chris Rogers was on the story and had more luck tracking him down then me. And as a special bonus, he was with Brad Pitt -- who is not bad on the man crush scale, but he's no Mega Matt. You’ve eluded me for now, McConaughey. Still a fan and, maybe for the best, not quite yet a stalker.